You can change a repository's visibility from private to public if you're an organization owner or have admin permissions for the repository. If an organization owner has restricted the ability to change repository visibility to organization owners only, members with admin permissions to a private repository cannot make it public. For more information, see "Repository permission levels for an organization." Tip: If you're converting your private repository to a public repository as part of a move toward creating an open source project, see the Open Source Guides for helpful tips and guidelines. Warning: When a private repository is made public, its private forks are detached. For more information, see "What happens to forks when a repository is deleted or changes visibility?" 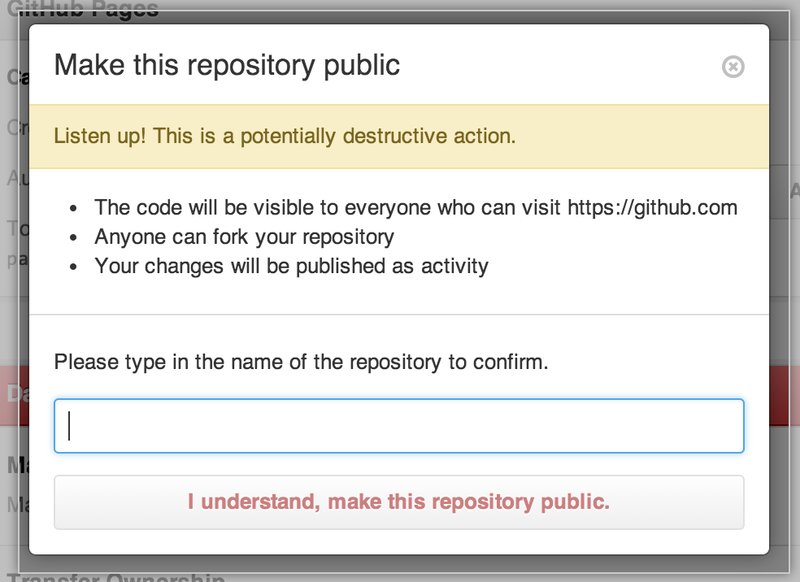 Type the name of the repository that you want to make public. Click I understand, make this repository public.